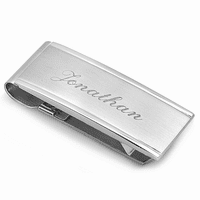 A money clip is the perfect gift for groomsmen, a graduate, or for a corporate gift! 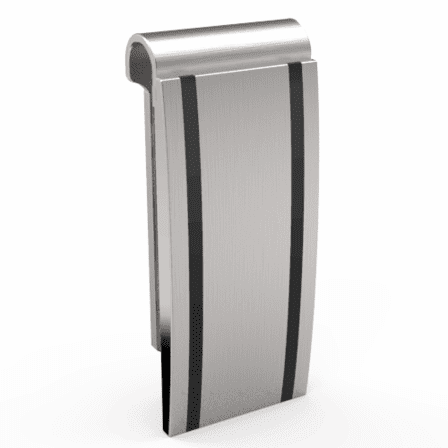 The Diego money clip has a contemporary sophistication that enhances any man's professional appearance! 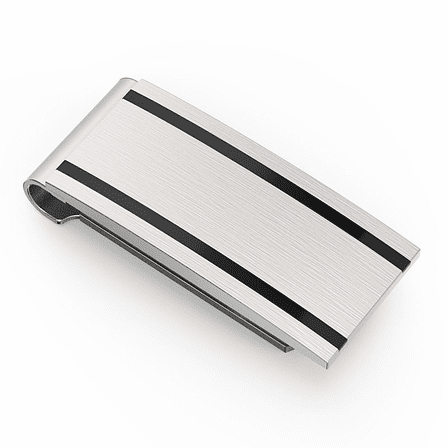 Made from brushed stainless steel, this money clip has jet black accent stripes that frame an area where you can have a name or initials engraved for free! The spring-loaded grip holds up to 25 folded bills, and comes packaged in a gift box that's ready for presenting! Dimensions: 2" x 3/4" x 1/2"
A place to put engraving information does not come up. Please explain procedure. Thanks. You'll need to check the little box next to where it says Personalize It. This should open up an engraving field where you can input up to two lines of text. What is the minimum number of bills that can be carried without coming out of the clip? The spring loaded grip pushes against the top of the clip so you should be able to carry just one bill. What is the normal font size to use for this if I want just initials? Technically just two letters? The font size 55 would work great for 2 letters. We're sorry, the engraving preview is only to show the sizing and placement of the engraving, we show it in black so it is visible on the preview screen. 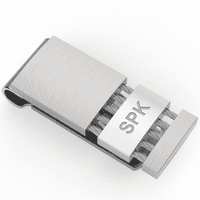 We'd be happy to send you a new money clip and make the engraving larger and/or deeper. We cannot make it black. Please let me know what you think. The acrylic accents should last a lifetime. If they don't, for any reason, this money cilp has a lifetime guarantee. Just call us or email us with your order # and we'll send out a replacement, no questions asked. How do you get the springs to work? The springs line up along 2 slots at the bottom and push up against the top, holding your money in place. How much for engraving, and with engraving, how long to recieve, I'm in California? Engraving is free of charge. 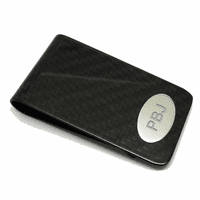 This money clip will ship the next business day, even with engraving. If you choose Priority Mail, you should have your order in 2 to 3 days. Will this money clip be restocked soon? It should be back in stock in about 2 months. As soon as its back in stock, we'll update it on our site. What is the best size to choose for initials? I was thinking 45 in Old English; what do you suggest? Yes, I think that font choice and size will look great. When you monogram for a man where do you put the last name initial. In the middle or at the right. Could you engrave a name in one size font and then on the line below in just a slightly smaller font put with love and a name? Sure, just check the "PERSONALIZE" checkbox on this page and you'll be enter your engraving for both lines and select and preview the font size. The black lines are made of hand painted acrylic. If only using one line for engraving and doing initials, will it be centered over whole area? Yes, we will center it top to bottom and left to right on the money clip. I would like to have something engraved on the back side of this money clip instead of the front. Is that possible? I'm sorry, that is not possible on this money clip. THE ONLY THING THAT SHOULD HAD DONE WAS THE ENGRAVING SHOULD HAD BEEN WITH BLACK BACK GROUND. IT' HAD TO SEE YOUR NAME THAT WAS ENGRAVED. Very nice, it is everything I was expecting, although it did not arrive on Time as promised. I gave it to him for our first year anniversary. He was thrilled! Merchant Response:We're so sorry this happened. It sounds like you've received a defective item, that spring should obviously stay in its track. We'd be happy to ship you a new one free of charge, of the same or a different style. 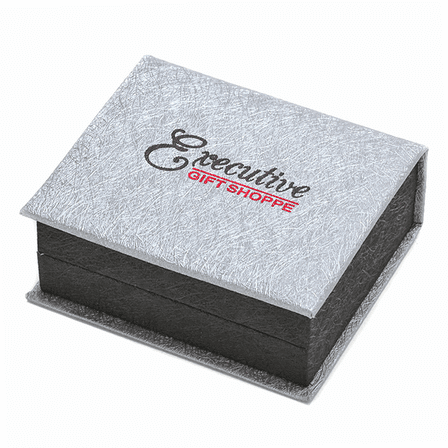 Can you email us at help@executivegiftshoppe.com with your name, order # or email address so and let us know if that will work for you? ProsCustomer service was great; person handling the order over the phone could not have been nicer or more accommodating. I got this as a gift for my father and he absolutely loves it. I definitely recommend it. Ordering this product was very simple and easy. It came in the mail sooner than expected, and was in perfect condition. (No scratches, scuff marks). The engraving turned out perfect as well. If you are getting yours engraved, I would suggest that you go a little bigger on the font than what you think you want because the money clip itself is pretty small, and you want the letters to show up well. Love this product and love doing business with this company! I bought this for my boyfriend's birthday and he loved it! He is a very fashionable guy, so that's saying a lot. I give it a thumbs up! The money clip was very nice and looks even better in person. Service was outstanding and they were able to get it to me fast since I ordered last minute. I had asked a question in my order that was never answered. Other than that, the money clip is beautiful, it's small (doesn't hold a lot of cards and money), but very beautiful. Love it. Engraving was perfect. ProsCustomer Service alone will bring me back. Quality of Product. Fast Free Shipping. Free Engraving. Came just as expected....Looks great! Very fast, easy to order, efficient and delivered, as promised in a very timely manner. what more could you ask for. Also, kept me updated as to the progress of my order. I got this as a gift and it looks great. Just as I had hoped. It's perfect with the engraving. I use this money clip to hold my cash and a couple of credit cards, it works great. I like how my money slides in and out without having to open anything. The engraving came out great too. The clip looks great especially with the monogram I had added. The only thing I wasn't prepared for is that this clip using a mechanism for holding the bills much like a spring. There are 2 pieces of metal kinda like paper click that are under tension to hold the bills in place. This causes the clip to be much thicker than any other clip I have every owned (even when empty). They provide great security for my bills right now because the clip is new. I see this being the failure point in this clip after years of use if there is one. The 2 pieces of metal are very thin and separate from each other so they could snap off independently from each other. Again, this may not be a negative and I'm just not used to it. The clip I was using that this replaced has been in use for over 5 years and its still functional but just old and scratched up. Excellent product, quick and accurate shipping. Worth every penny. Strongly recommend. Very good quality and the engraving looks great. The service was fantastic and very fast! !